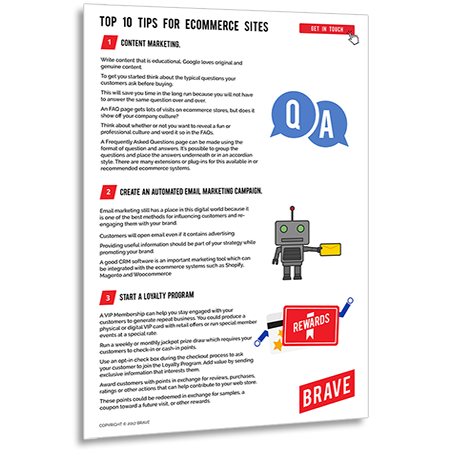 10 Free Tips for eCommerce Sites from Brave Web Stores. Write content that is educational. Google loves original and genuine content. To get you started, think about the typical questions your customers ask before buying. This will save you time in the long run because you will not have to answer the same question over and over. A Frequently Asked Questions page can be made using the format of question and answers. It’s possible to group the questions and place the answers underneath or in an accordian style. There are many extensions or plug-ins for this available in or recommended ecommerce systems. An FAQ page gets lots of visits on ecommerce stores, but does it show off your company culture? Think about whether or not you want to reveal a fun or professional culture and word it so in the FAQs. Email marketing still has a place in this digital world because it is one of the best methods for influencing customers and re-engaging them with your brand. Customers will open email even if it contains advertising. Providing useful information should be part of your strategy while promoting your brand. Good CRM software is an important marketing tool which can be integrated with the ecommerce systems such as Shopify, Magento and Woocommerce. A VIP Membership can help you stay engaged with your customers to generate repeat business. You could produce a physical or digital VIP card with retail offers or run special member events at a special rate. Run a weekly or monthly jackpot prize draw which requires your customers to check-in or cash-in points. Use an opt-in check box during the checkout process to ask your customer to join the Loyalty Program. Add value by sending exclusive information that interests them. Award customers with points in exchange for reviews, purchases, ratings or other actions that can help contribute to your web store. These points could be redeemed in exchange for samples, a coupon toward a future visit, or other rewards. If you don’t have at least one social media profile, then you should choose one that suits your business. Which social network do your customers use and what content can you offer that will keep them engaged? Don’t bombard them with details about you or your product/service. Use the 80/20 rule. 80% of the posts should be about topics that interest or help your customer. The other 20% can be promotional. Have you heard of the Money off Roof (MoR) test? A social media strategy should be treated like an investment. There has to be a measurable return to see it’s value. Would you create more social media activity if you took all the money you spend on Social Media and threw it all off the roof of your office building? If you choose to invest in social media, be sure to measure the value of your return. Are you generating sales from your Facebook posts? Is there engagement growth on your video channel? All social media platforms have stats to help you gauge insights into the activity on your accounts. Integrate these with your web traffic reports and setup conversions to track lead generation or sales. Most important device is in you and your customers hands. Clear Call to Action. Make the Buy Button front and centre. Make it easy to get back to the homepage. Don’t let promotions steal the show unless you have created a special mobile ad. Is it necessary for users to find info via site search? Use click-to-call buttons. Show contact details in the footer. Make it easy for your customer to continue on another device. e.g. add an email button or share this icon. Studies have shown that orders with free shipping average around 30% higher in value those that charge a few dollars for transport. The number one reason for cart abandonment is hidden delivery costs at the checkout. Shipping is integral to the online shopping experience. It can make or break a sale if your online shopper has to go searching for your shipping costs. We recommend that you do as much as possible to address shipping concerns in the design of your web store to make your shoppers experience as smooth as possible. Are there ways you can speed up the delivery process so that you can stand out from your competition? If you have a reputation for fast delivery, and the occasional expedited delivery for random customers then you can make people feel special. Display any shipping benefits where your web store visitor is looking most e.g. next to navigation, search bar, prices and Add to Cart buttons. If you offer free delivery, make it clear, in bold, all-caps and at the top of every page. If you have one standard flat shipping cost, encourage customers to maximise this by adding up to specific quantity of items in their cart for the same shipping price. If you have various shipping options, make your web store visitors completely aware by placing all your service propositions clearly at the top of the homepage. This helpfully answers many questions that a new visitor may have when they arrive on site. Multichannel selling is having your products for sale on multiple platforms, including ecommerce platforms, various marketplaces, and offline. Marketplaces are sites like eBay and Amazon with information about third party sellers and products. 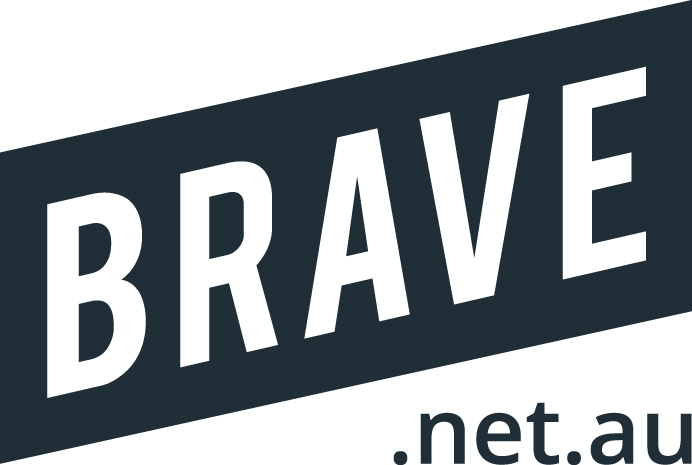 The ecommerce systems that Brave recommend allow you to sell your products in marketplaces as well as social platforms. These offer opportunities for generating sales where you can tap into new markets and alternate demographics. Many of the tools allow you to simply click one button to import into eBay or Facebook from your webstore. You can drive traffic from Facebook & increase your online sales or list your Shopify products on eBay, be set up in minutes and sync inventory. Video is now an essential part of the sales process. Online video guides are engaging and shareable. Brave clients use video to provide instructions to their customers on how to use their products and services. This can save $1000 in broken equipment and is a massive convenience for customers. Subject or interest that your target audience and brand care about. Find an element in your product or service that your audience finds useful or entertaining. Videos should be part of a series, break it down into bite-size chunks and post on a regular schedule. Invite guests to broaden the appeal of your content to attract new audiences. Try and build your content in batches to keep costs down. Embed your video on your social media channels. If you sell something like gardening products, customers may not know the best ways to use the gear they buy. Video can bring them back to your store and ensure they feel right about buying from you. Allow your customer to save their cart or create a wishlist – many shoppers use a cart as a wishlist for later. Give shoppers the choice to checkout anonymously – it can be frustrating to go through the process of “Registration” or “Account Creation”. Customers are happy to provide their contact information in order to track their purchase after the order. You could also offer benefits to sign-up after the sale, such as early bird or member discounts. Reduce the checkout process to a single page. Include shipping / delivery details on the checkout page. Allow your web store visitor to update quantity or remove from their cart on the checkout page. Add product ratings or testimonials to encourage confidence about ordering a product. Offer multiple shipping and payment methods. Do you have two different products or different ideas on how to sell? Why not create separate pages to test which get’s the better result. In turn, this can help you increase your revenue and make the most of every visitor who comes to your website. With Google Analytics, you can compare how different web pages perform using a random sample of your visitors. Let’s say you have a website where you sell sports shoes. You offer cross trainers for runners or gym junkies. With your AdWords account, you advertise your cross trainers for gym junkies because it’s where you make your most money. To increase your return on investment and your business’ profits, you’re interested in getting more people to purchase this option. Right now, people who click on your AdWords ad for gym cross trainers on a dedicated landing page that explains all cross trainers. Because this is your ad’s Destination or final URL, this is the first page that you want to use for testing. For your Google Analytics, you create several new versions of this web page – one with big red lettering selling the cross trainers for runners, one where you expand on the benefits of the cross trainers for runners, and one where you put an icon next to the link to purchase the cross trainers. Once you’ve set up and launched your experiment, a random sample of your website visitors who go to that Destination or final URL will see one of the three different pages, including your original web page. Then it’s only a matter of waiting to see which page gets the highest percentage of people to purchase the cross trainers for runners. When you’ve worked out which page best helps you accomplish your business goals, you can make this page live so that all your site’s visitors see it. Use social media to test your ads. You can post as much as you like on Facebook at no cost. Compare the shares / likes / sales on each ad.